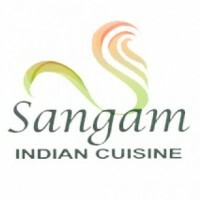 Sangam, a restaurant that specializes in Punjabi food (my favorite)! The menu has an impressive list of 21 vegetarian options (not counting many of the appetizers, soups and salads, or accompaniments). At least half of those options are vegan or can be made so. How did we find out? We asked our waiter, who was extremely knowledgeable about the food. The reason was quickly apparent – the food was excellent. We ordered Vegetable Patia, “fresh vegetables cooked with sweet and sour mangoes, spices and herbs with a touch of ginger”; Palak Paneer without the paneer; Mushroom Broccoli Karhi, “fresh mushrooms and broccoli sauteed in a wok with onions, bell peppers, tomatoes, ginger, garlic and herbs”; and Vegetable Vindaloo. I was a little daunted at first by the Vegetable Vindaloo – it was very red, and I’m very sensitive to red food coloring. But I didn’t get sick, so the red coloring must have come from just tomatoes and a healthy dose of paprika. The food is a bit modern because it uses fresh local produce (i.e., vegetables like broccoli and summer squash, which are not traditional components of Indian meals). Also, compared to many Indian restaurants, the food is lighter, less oil. However the seasonings are the traditional North Indian/Punjabi spices! The service was excellent. We were served by both a waiter and the manager (owner)? They were both very gracious and charming and the manager was almost courtly in his manners! There was a small error in our bill but that was quickly and smoothly taken care of.